Caracas, Venezuela. Here one finds monuments and motorways built under the modern vision of the 50s, side by side with areas where huts and smallholdings rub shoulders, without permits or planning. Here, in this city of close to five million inhabitants which, in the 70s, flourished in the middle of an oil boom, water nowadays is not only more expensive than gasoline, but appears and disappears at random. Recently, in the Avenida Bolí­var, the urban traffic artery, the National Government planted agricultural crops as an incentive to employment. In Caracas, five police forces are unable to keep order, and there are numerous underground economies in this market which creates its own rules on economy and space. The city is divided into physically and politically occupied and liberated territories, the scene of changing, hybrid relations. Even public protests form part of the urban landscape. Represented here is what Carlos Fuentes, in his book The Buried Mirror, describes as the symbol of the unfinished, of the lost development typical of Latin America. Caracas, within its complexity, has large buildings erected in an effort to progress, standing side-by-side with others left unfinished, or which have crumbled into ruins. Caracas as a political, social and cultural laboratory is case for study. For the purpose of study, The Caracas Urban Think Tank organization [Alfredo Brillembourg (founder) and Hubert Klumpner, architects and directors of CCS-TT, Caracas established in 1993], together with the German Cultural Foundation, have thought up the Caracas Case: Informal Urban Culture, project, where the Venezuelan capital is put under the microscope to question "the existing, inconclusive and chaotic examples of Latin American cities through an understanding of their changes". The project consists of various phases. The first is represented by an invitation sent to 17 specialists (photographers, architects, experts in city planning, semiologists, sociologists, engineers, film producers, social communicators and writers) from countries such as Austria, Brazil, Germany, Israel, Japan, Mexico, Slovenia, the Ukraine and the United Kingdom who, grouped into 10 teams, worked in the city on an investigation process which gave rise to a series of projects. The second phase of the process consisted of a symposium at the Venezuelan Central University, attended by speakers which included Diana Agrest, architect and professor at the New York Cooper Union; the German economist and sociologist Elmar Alvater, professor at Berlin's Freie Universitat; Guy Battle of Battle McCarthy, environmental expert and civil engineer; the social sciences and history of art expert Regina Bittner, from the Bauhaus Dessau in Germany; Néstor Garcí­a Canclini, philosopher and anthropologist, director of the Urban Cultural Studies program at the Mexico City Autonomous Metropolitan University and author of various books such as Culturas hí­bridas. Estrategias para entrar y salir de la modernidad (Hybrid cultures. Strategies to enter and leave modernity), and Celeste Olalquiaga, Venezuelan cultural historian, resident in Paris, author of texts such as Megalópolis and The Artificial Kingdom: A Treasury of the Kitsch Experience. 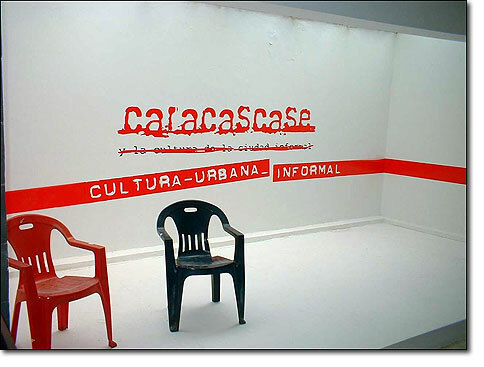 The part corresponding to a third phase is presented in the Caracas Case: Informal Urban Culture showcase, on display at the Sala Mendoza from August 17 to September 15, 2003 when it continued its travels to the Kunsthalle Dusseldorf in Germany and to other cities of Latin America, the United States and Europe, where the public can see the projects of scholarship students within a curatorial arrangement of "works in progress," as a flexible structure resulting from process documentation. The Caracas Case showcase works as a "think tank", a "living file" calling for reflection and redefinition, while the project, taken as a whole, will take final shape in book form in 2004.